Way back in 1893, Charles Noke tried his hand at modeling several large display vases and figurines for Royal Doulton to be shown at the Columbian Exposition in Chicago that same year. Many of these first figurines depicted court jesters in a variety of poses and were decorated primarily in pink and green. These were exhibition items and never went into commercial production according to the late Ralph Kovel and his wife Terry in the Illustrated Price Guide to Royal Doulton. Since then, a plethora of Royal Doulton figurines, character mugs, and Toby jugs have been made by this famed company. In 1909 Noke took another stab at developing a line of commercial figurines. By 1913, he and several other sculptors had designed 20 new models. It wasn't long until Harry Nixon, in charge of the figure painting department in the Burslem, England factory, suggested that the different figurine shapes and colorations be given numbers. A series of HN – short for Nixon's moniker – numbers became an integral part of each item produced shortly thereafter. Even later figurines have Nixon's initials and a corresponding number stamped under the glaze on each piece. These HN numbers mean the world to dealers and collectors. They allow even the novice who picked up a piece at a rummage sale or the fortunate fellow who inherited a figure from a relative to easily identify and value his treasure. Whether it's Leslie Harradine's delightful depiction of motherhood called Contentment, marked HN395, or his classic The Old Balloon Seller, HN1315, buyers and sellers can communicate through these convenient numbers. There was even a line of Elvis Presley figurines produced in 2005. A perusal through a list of marks for this company, like the one compiled in the Kovel's reference, may seem a little confusing at first. Sometimes the company's lion mascot is perched atop a crown on the mark; other times the lion stands directly on the Royal Doulton wording. Don't let these distinctions throw you. Think of these subtle differences in the mark as a way to date a piece and use a collecting guide to help things along until you're very familiar with the variations. 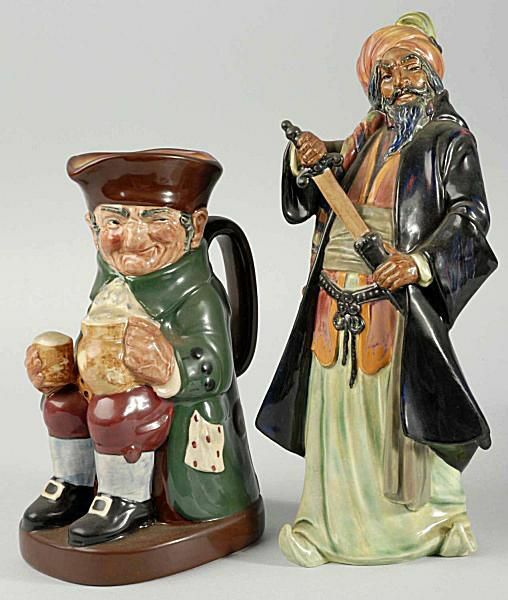 The exact origin remains uncertain, but Toby jugs may have gotten their name from the carousing Shakespearean character Sir Toby Belch or from the 16th-century song about Toby Philpot. Since both men were legendary drinkers and these vessels had been popular in English taverns for centuries, either theory could have merit. Regardless of the naming source, Royal Doulton first made Toby jugs in 1939. These delightful handled vessels vary in size and depict real-life characters such as Sir Winston Churchill and fictional favorites from Charles Dickens classics. A nice collection of Royal Doulton Toby jugs can be gathered, but the selection of character jugs available far out numbers their full-bodied cousins. Charles Noke first came up with the idea for the character jug in 1933. Again, we see Dickens characters as a central theme for these whimsical mugs denoting Noke's fondness of the English writer. His willingness to pay tribute produced a line of very lifelike and detailed mugs in varying sizes. Many times the figural handles on these pieces provide another detail about the character, such as Sairey Gamp's umbrella or Long John Silver's parrot. Most jugs received factory marks, just like the figurines, but with the prefix D instead of HN.